Originally posted at Gypsy ReviewsI received a review copy from Harlequin via NetGalley. Thank you!Having first experienced vampires in YA books when I first read Twilight, that marred the entire experience and world of vampires for me and I vowed to myself to never read another vampire novel again. Though after hearing much about Julie Kagawa, I decided to give her a shot and I am so glad I did because The Immortal Rules was such a great read – filled with action-packed moments that will get your heart stuck in your throat. Kagawa managed to put her own spin on vampires and succeed in making it authentic to typical vampire lore.Earth is now ravaged by vampires thanks to the Red Lung disease that spread and caused the deaths of many humans, with the subsequent experimentation on vampires to find a cure for the disease turning many vampires into rabids. Allison Sekemoto lives in New Covington which is a vampire city where the Registered humans can live peacefully within the walls of the city and be well fed but it all comes with a price – they have to provide blood to the vampires regularly. Allison, however, is an Unregistered and she has to scavenge for food with her gang to survive. One day, she goes out of the city walls and stumbles upon a food source. The next day, she and her gang go back to retrieve the food however they are attacked by rabids and Allison is nearly mauled to death by them until she is saved by a vampire, Kanin, who gives her a choice – die or die and live again as a vampire. Allison chooses to become a vampire and from there begins her new life.Allison is a terrific character – one who knows and understands the conditions of her hard life but yet her heart chooses to do the human thing. She’s not only strong-willed but soft-hearted as well and at times it is her downfall but it also shows her loyalty and the best of her. Her decisions and emotions were very relatable, she’s quite a likable character in general. I was a little hmmmm about her romance with Zeke, unlike a lot of romances I’m usually ‘Nope’, I did like Zeke and Allie but it sort of left a bad taste in my mouth? So it wasn’t horrible but it also didn’t really work for me even though I could accept it. I think this is just me though, I have no idea why I didn’t like it so much because I should have liked it, there was development! I was rather interested that when Allie wanted to kiss Zeke, she not only wanted to kiss him but bite him too. It really spoke about the vampire within her, how her vampire instincts wanted her to mark Zeke as her own through biting him.I really liked the vampire lore here, it was made actual sense you guys! Vampires burned when in the sun! They can be killed by beheading or stabbed by a stake in the heart! YESS. It has somewhat fascinated me about the concept of having humans as blood bags in YA (not in a creepy way but more of I’m glad authors are exploring this concept) and it did make a lot of sense as to why the world is like that now with vampires. Clearly, vampires are the superior race of the world and with their heightened abilities, humans would fall down to them. That brings me to another point I liked that how vampires weren’t invincible. Vampires could still die, even under human hands and they aren’t entirely immortal because they can live indefinitely but their superpowers do not get to the point where they’re untouchable.I was a little sad we didn’t see more of Kanin, I know in The Eternity Cure we do see more of him and I’m glad. There’s a lot more of him we haven’t seen and Sarren, I’m wondering about their history. Kanin is rather mysterious and hard-headed, he’s straight forward and does not sugarcoat anything for Allison when she becomes a vampire. Rather he wants her to face the facts soon before they blew up in her face. Kagawa nailed her characters, you really could relate to each and every one of them even if you didn’t like them but you could relate to how they felt. You couldn’t blame them for their actions because it was understandable, what would you do if you were in their shoes? Though at times it was hard to believe Zeke was that self-sacrificing and he cared so much for the people he loved. He did seem a little too good to be true.I was confused by how if Jeb believed that God had abandoned them, why did he still pray? Who was he praying to? That part didn’t really make too much sense to me?This book was so action-packed! It was a tad bit gory but it really got my heart pumping and I loved that. It’s rare when a book really makes you stop and you feel chills down your spine and you’re paralysed with the fear you feel for the characters. 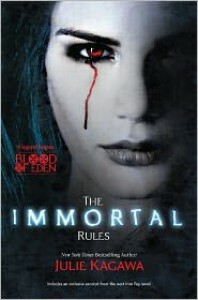 It is a long read though, I read it on my Kindle and it felt slow but in actual fact in hardcover this is around 500 pages so it could be a bit of a drag but it is worth it.Julie Kagawa manages to nail vampires in The Immortal Rules which is dark, gory and forces you to face the fact that there is no escape in their world. Highly recommend it to those who like action and are looking for a vampire novel that features vampires that actually follow vampire lore and a romance that has development. You will definitely be sated (heh pun intended ) with what Kagawa has provided in this novel and I hope The Eternity Cure is as every bit good as this was.